The Lost (And Found) Mind of Kaleesha Williams: Free to Discriminate? I support gay rights. It breaks my heart to see other human beings bullied, stigmatized, shamed, frowned upon or otherwise discriminated against, especially when the source of belief that supports such behavior comes from a work of literary fiction. When I first heard the story of the gay couple who were refused service by a bakery (a custom wedding cake) for religious reasons, and the ensuing lawsuit claiming discrimination, I stood with the business owner. I imagined myself as a business owner and I wouldn’t want someone telling me I had to serve someone whose behavior or values were so offensive to me. I probably wouldn’t rent space to or design a website for the KKK. If a customer was causing a disturbance or shoplifting I would refuse them service. 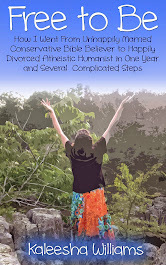 I used to be religious, so I can even imagine the dilemma of being in the position of having to reject the things God rejects. I think that falls under religious freedom. As much as I think the religious have far too many privileges that the rest of us don’t have, at this point in time our country does grant religious freedoms. 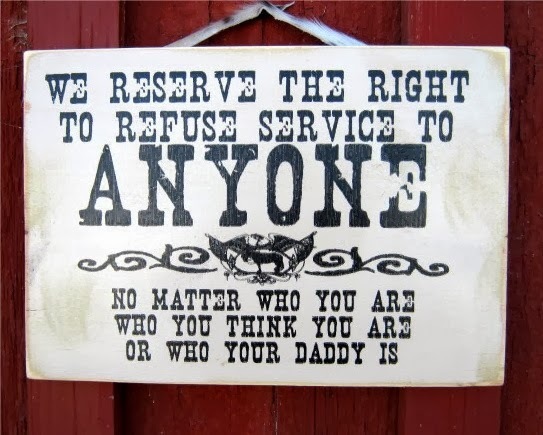 This right to refuse service to gays thing has gone viral. People are pushing for it, trying to pass laws in every state to protect business owners. But, I’m a gay rights supporter now. 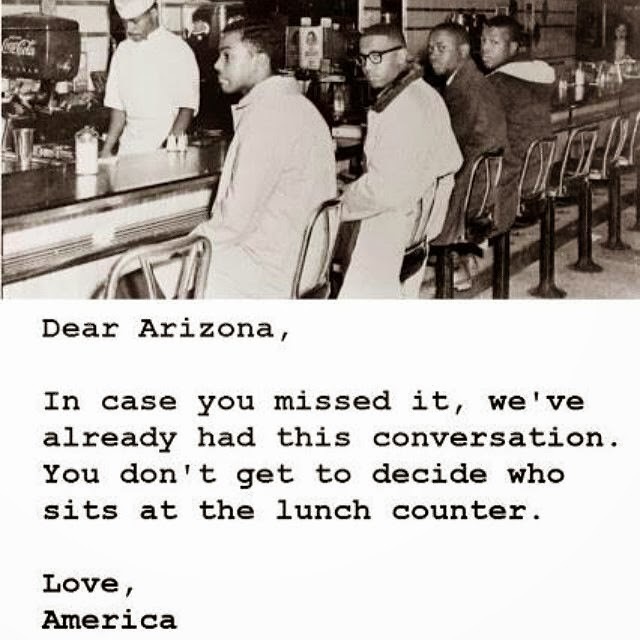 And the folks on that side are screaming "discrimination," saying this is no different than the race issue, that America is reverting, that if we allow discrimination against homosexuals then we will also have to allow businesses to refuse service to blacks again. I see that side, too. And I’m still in the place, so close to my religiosity, struggling to shimmy free of it, that I now assume my first gut reaction is the wrong one, the inherently Christian one, and that the other side is right. I gotta learn to trust myself more. Slow down, think it through. I don’t feel too bad ‘cause this is a hella crazy social issue. There may be no right answer. I empathize with the discriminated. It’s sad that there are people in our varied American culture who continue to condemn others in such a fashion. I generally support the gay community in their plight for equality. I’m just not sure if fighting these “right to refuse” bills is going to change anything. It puts a lot of non-gays unnecessarily on the defensive, opens a whole other can of worms (business owner’s freedoms across the board), and for what? So you can do business with those who would chose to refuse you service if they could? Why would you give these people your business? I’m thinking maybe just let this one go. Winning this one isn’t going to gain you the respect and equality that you want. Give them what they want. They want the right to refuse service to whomever they choose? Fine, but under one condition: they post it. It must be clearly posted whom they are discriminating against. Now consider this for a moment… They must tell the world that they are haters. With their freedom to discriminate also comes a customer’s freedom to discriminate. With their hard-earned cash. The gay community and their many supporters can take their business elsewhere. I personally wouldn’t give a dime to a discriminating business and I would politely let them know this. Maybe they will see that discrimination isn’t good business sense. Maybe eventually they will see it doesn’t make sense in our society. Is there a better solution? Is there any good solution in a situation where one party chooses to hate another? I have seven children. I can make my children play with each other, but sometimes they just don’t want to. (We never have hate issues, just an occasional bad mood.) If I force the situation they never play nicely. Usually the best approach is to let it work itself out (maybe with just a little observational instruction from Momma). It’s made clear to the child with the bad attitude that the other children don't want to play with him or her unless he or she is playing nicely. This child then plays alone in another part of the same room. It never fails that between loneliness and the combined laughter and enjoyment of the other children, he or she is lured out of the corner to join pleasant society. THIS is a GREAT concept! Agreed. Posting your discriminating propensities allows for reciprocal discriminating decision-making. It just might work! Discrimination is NOT a "bad" thing. My discriminating palate allows for discernment in what i enjoy and decide to feed my body.